If you're like me, you've spent more than a little time scratching your head looking at various vintage machine models and makes. The variety is just astounding--even within the same manufacturer! While it is fairly typical that every major release gets a handful of cosmetically and mechanically similar models--perhaps a straight stitch only version, zigzag version, and a cam version--and while sometimes, we get way more variations (free arm vs. flatbed), mechanically, the machines are very similar, either adding or omitting modular components to ease the manufacturing process. Bernina, is no exception. 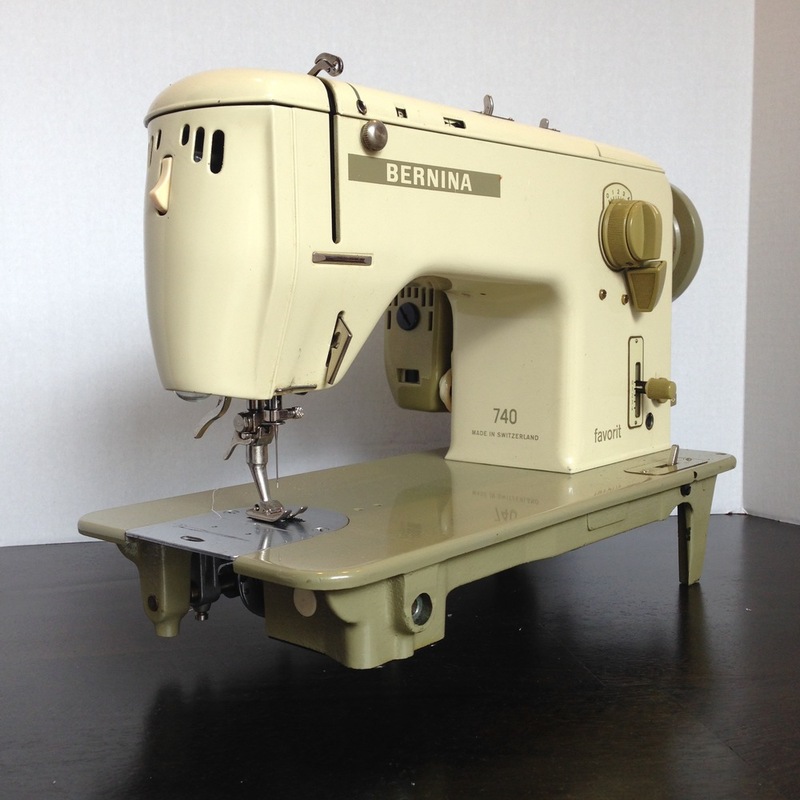 The Bernina 740 Favorit is a flat bed, high speed, rear loading, rotary hook artisan machine that features an external motor and the classic 20 Bernina stitch patterns via an internal cam stack. On the surface, the feature set, minus the free-arm, sounds strikingly similar (identical) to the Bernina 730 Record. So why does this model exist? Especially when we already have the 718 and 719 which are basically the flat bed variants of the Record as well. The answer, is in the hook. Read about hook types here. If you're a Bernina aficionado, you may be wondering why this doesn't use the patented CB hook that made Bernina so famous. Well, in the battle of the hooks, we all know, the rotary hook won out due to its ability to deliver higher top speeds with minimal vibration. Obviously, Bernina knew this too as they've since changed their designs to use rotary hooks, but the CB hook was basically a big marketing ploy to make their oscillating hooks sound better on paper to their consumers. This is all speculation, but my guess is that marketing worked so well, the Favorits just weren't all that popular, at least in the U.S. The 740 Favorit uses a single belted, .9 amp external motor coupled with a rear-loading rotary hook making it about 20-30% faster than the Records. She tops out at a respectable 1250-1300 stitches per minute. The positioning of the hook is not unlike the Bernina 217 industrial. The solid flatbed construction give this machine a lot more heft than its free-arm cousin. To be fair, from the consumers perspective, the Favorits kinda sit in no man's land, giving up a free arm for slightly more speed and significantly more heft than the Records but not beefy enough to be truly industrial. They can and often are, table mounted and used with industrial motors placing it solidly, by definition, in the artisan machine category. You may want to read my review of the 730 Record first as this uses nearly identical controls. Now onto the differences! While the needle plate and slide plate are obviously different from the 730 Record, of more note is the change not in the feed dog configuration, but the texture of the teeth itself. The teeth of the 740 Favorit, while still saw tooth shaped, are slightly more forgiving on delicate fabrics while retaining their grip. Like the Records, this machine uses Bernina Old-Style (vintage) feet. Comparing the the stitch length and width controls (4mm max) reveals a near identical setup down to the adjustable LCR needle positioning and buttonhole control with two major differences. The x40 flatbed design necessitates that the knee lifter mounts from a much higher position on the machine. In fact, the knee lift mounting profile is different altogether, meaning the knee lifter itself is not interchangeable between machines. The second difference is more cosmetic, the 740 uses a sturdy lever instead of a plastic knob to drop the feed dogs. The cam selection mechanism and stow-away bobbin winder mechanism is identical to the 730 Record. Another notable difference is the presence of an additional screw outside of the upper tension channel. This useful addition can be used as an optional threading path to add extra upper tension. 730 Record thread take-up lever. Furthermore, the thread take-up lever features both a quick threading channel--a slit that allows you to easily thread your take-up by slipping your thread into the take-up--and a secure threading channel (hole) for higher speed use. Industrial machines never use quick threading channels because at high speeds, your thread can (and will) pop out of the take-up lever. Opening the nose and popping the top reveals identical internals to the 730 Record. I won't belabor the point, but just like the Records, the Favorits are prone to having cracked nylon cam gears. Moving to the underside, the design is quite different due to the flat bed. But what's this? Another nylon gear! Apparently these gears started off as steel but depending on the machine's vintage, were gradually made with nylon instead. I believe I counted five nylon gears during a cursory inspection. Thankfully these are all intact. To round out the review, here are some side by side comparisons of the 730 Record and the 740 Favorit. While the 730 Record is significantly taller than the Favorit, the Favorit is the heavier machine of the two by a good margin. I'd be lying if this wasn't my 'Favorit' of the Bernina 700 series. It is clearly much smoother and faster than the 730 and even the later 830 Records. Do you have a favorite Bernina?